PaintShop Pro, from Corel, has long been a low-cost alternative to Photoshop. And while it performs a surprising number of the whiz-bang functions Photoshop is famous for, it's clearly not the real McCoy, in terms of feature set and performance. That said, PaintShop Pro X6 is a fantastic value, especially when you consider that the Ultimate edition includes some powerful plugins you'd pay hundreds for on their own. The interface has been tidied up from its predecessor's confusing array of buttons and menus, though it still falls short of Adobe usability. It's true that you get what you pay for, but PaintShop Pro is still a viable low-cost alternative, and the new version adds some enticing features of its own, along with a tidied-up interface and 64-bit performance. The installation process was very easy and it worked successfully. The installation was from a single CD/DVD and the tool installed in about 10min or so. If you have an older version on PaintShop Pro X2 it will not impact the installation / setup of that version. So afterwards you will have both programs running on your PC if you desire. If you don't want this you will need to uninstall your older program separately. After you install the program, I recommend that you register the product, what is nice is it stores a copy of your serial number online as part of your account. Which is great since it's easy to misplace the CD/DVD serial number over time. Overall, I thought the program performed well on my machine which is a few years old . Only problem I encountered is when you run some of the artistic filter and apply them to your photo it can take between 5-10 seconds for the effect to appear on screen. Which isn't too bad but, if you are trying to apply multiple effects to a number of images, it does slow down your workflow time. This is the only areas I would have liked its performance to be better than older X2 version. When applying other controls, such as, brightness, color balance, levels, etc., it performs great without notice and your changes are applied in real-time; which is great considering this is where most people spend their time editing photos. I really liked the way that PaintShop ProX5 Ultimate handled file management. It represents it as another tab and does not required the importing of images into a separate database that can be come corrupt over time. While in the program, I really liked that the Adjust tab that it gives you the smart photo fix, white balance, brightness/contract, fill light clarity, tone mapping, sharpening and noise removal just to the right of your image. I personally find that most of my images can be enhanced via these easy to use tools. Which is great if you are new to using PaintShop...no looking for them under the menu system. Lastly, the app does recognize your camera GPS data and will plot your images on a map; which is cool, and it has a built in HDR image generator. 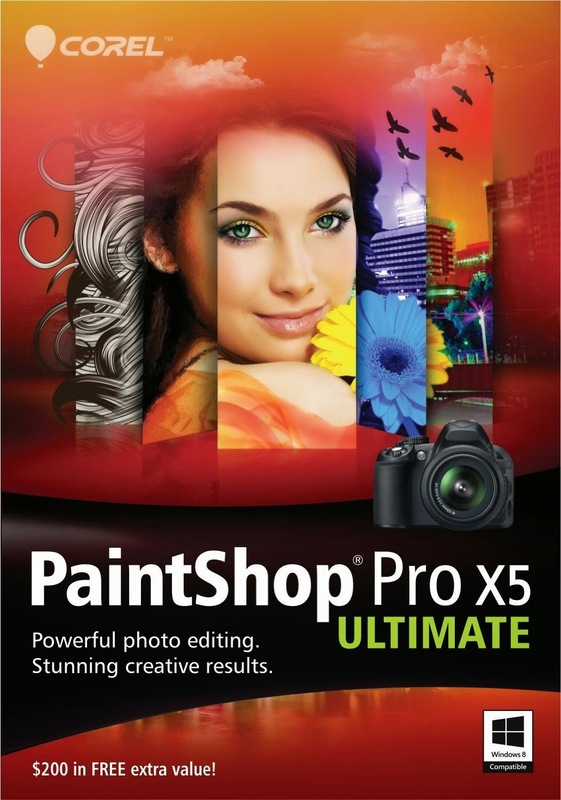 Based on the price and what you get in terms of out of the box features, I would say PaintShop ProX5 is a bargain when you consider the price tag of Adobe Lightroom, Photoshop and Elements. 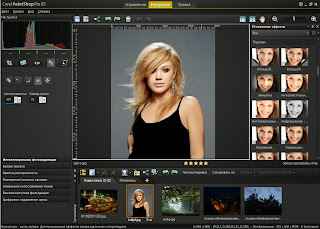 * NIK Color Efex 3-This software add a bunch of effects and film types that you can apply to your photos. * Reallusion FaceFilter Studio 2 is a cool app that will allow you to modify any portraits you take to have that fresh model looking airbrushed effect. I thought the tool was very powerful, but its interface is kinda clunky and dated looking. Also, I had a problem with the serial number installation key; which made the installation a pain. Luckily, if you go to Corels website they inform you about how to correct your license key so you can complete the installation. * The Creative Collection adds another bunch of cool effect you can apply to your photos...so many in fact that it will make selecting one very difficult. Turn everyday photos into stunning images in just seconds with the quick and easy photo-editing features of PaintShop Pro X5 Ultimate. Use new Instant Effects to apply visual presets to get the perfect look for your photos and create and customize your own presets for use in future projects. Recreate lowfi camera effects using the all-new Retro Lab or try the new Graduated Filter tool to quickly and easily add unique color gradient effects to your images. Share your photos and designs with the world using the new and enhanced social media features of PaintShop Pro X5 Ultimate. Create online albums, add descriptions, and simultaneously upload your photos and designs to Facebook, Flickr and Google+. 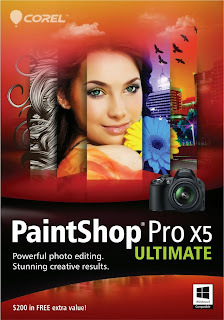 PaintShop Pro X5 Ultimate is more than just a photo-editing solution, it's also a powerful design program that's perfect for any visual project whether you're creating dynamic logos and designs, developing images for the web, or adding creative touches to your photos. Enjoy a variety of powerful design features, including creative brushes, textures, layers, vector tools, and more. Autobracketing is a powerful camera technology which automatically takes multiple shots of the same scene with different exposure settings. PaintShop Pro then selectively recombines the shots to create a single stunning HDR (High Dynamic Range) photo with intense visual contrast. 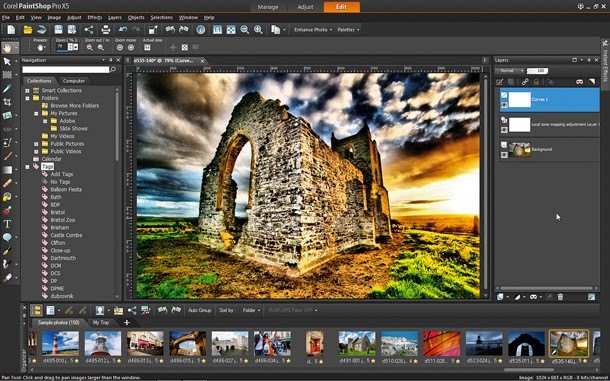 PaintShop Pro X5 Ultimate includes a variety of enhanced HDR features, including Exposure Merge features which allow you to preview HDR photo alignment and create black and white HDR photos. For added functionality, the Single RAW Photo feature allows you to split an individual RAW file into three images and then selectively recombine them to create an HDR-style effect. RAW is a powerful photo format which contains more information and detail than the traditional JPEG format of most digital cameras. 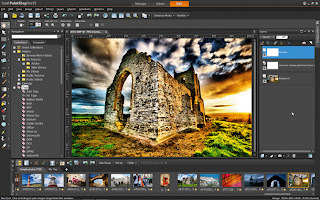 PaintShop Pro X5 features the Camera RAW Lab, a unique tool system which supports hundreds of camera models, allows for simple batch processing to convert RAW image files, and includes the ability to apply non-destructive adjustments to your RAW photos. Explore virtually endless possibilities to enhance and transform images quickly and easily with the unique effects, styles and filters of NIK Color Efex Pro 3.0. 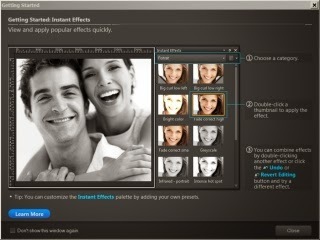 Touch up the subject of your photos with REALLUSION FaceFilter Studio 2.0 portrait enhancement tools. And, add another dimension to your images with dozens of new brushes, textures and 100+ royalty-free backgrounds. Overall, I was very impressed with PaintShop ProX5 Ultimate. I found the program to be very easy to use and its auto tools very helpful in quickly adjusting your snapshots. Plus, if you want to spend time really editing your photos to turn it into a piece of art...well, let's say if gives you a tons of options and controls to make this happen.